I watched this film today with my dad and we were both laughing at it every ten seconds. 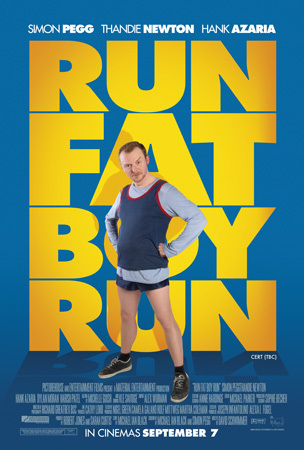 Simon Pegg plays Dennis extremely well and is a fantastic actor. I am a big fan of his other films, Hot Fuzz and Shaun of the Dead and this one is equally as good. What’s so hilarious about is, not the narrative itself (which I find to be perhaps a tad weak) but the way that Dennis interacts with other people and the sheer slapstick in it. I find the relationship between Dennis and his son particularly sweet and at times I felt sympathy towards Dennis as Libby’s new boyfriend, Whit, was trying to take over as Dennis’ son’s father. This, I found, was a deeper storyline and added a sense of depth and meaning to the comedy film. All of this between Dennis, Libby and their son balances the film with the comedy and makes it more enjoyable from the ‘what will happen to Dennis?’ factor. Overall, a good watch, but the idea of a man running a marathon to win his lady’s heart just seems a little…well…cliche and weak. But it is a fabulous film.